Steve, Lisa, Amber, and Brooke Griswold with our friend Scott from CNN Channel 9 News, at Walt Disney World. We love Walt Disney World so we have dedicated an entire section of our Griswold Road Trips to Disney Destinations. If you are planning a trip to Disney, check out our road trip videos, Disney travel tips, Disney money savings ideas, and latest news from the Disney Parks and Disney Cruise Line. You can also follow us on our Griswold Family Vacation YouTube Channel. If you have not heard, I quit my job after 17 years. I wanted to take my family on an Adventure, not just a vacation. We took an Adventures by Disney on the AmaViola. We did our first car show and it was at Walt Disney World, Car Masters Weekend. WOW, what an amazing event. I road tripped down 8 hours from Atlanta GA to Walt Disney World and had a blast. The event had over 100 cool cars, exhibits, Pixar Cars, a Pixar movie cars marathon at AMC, food trucks, Chip Foose, and so much more. We actually won an award for the Griswold Family Truckster from Disney•Pixar’s Cars filmmaker Jay Ward and the great folks at Pixar and Disney. We are on a true European Vacation and are at Disneyland Paris. Sleeping Beauties Castle is the most magnificent Disney park castle built and we are taking you on a walking tour of this fairytale castle. And a storybook castle is not complete without a dungeon and a dragon. Become a pirate, an empress, or a mermaid at the Pirates League over in Adventureland. We took the kids to be transformed and had a great time. If you are looking for something extra special and different to try at Disney World, be sure to watch our Griswold Family Vacation video on the Pirates League. I know I love to get on the rides normally when the parade is going down the street at the Magic Kingdom, but Disney has a new 3 o-clock daytime parade and I have to say, you don’t want to miss it! The Festival of Fantasy parade has big over the top floats, lavish costumes and a show stopping mechanical dragon that just plain cool. On your next Disney World vacation you will get Disney MagicBands in your Walt Disney World Vacation package. These come as part of your Disney vacation package for onsite Disney World Resort guests. If you are staying at a Non-Disney owned resort, or “Off-Property” You can purchase a MagicBand at any of the Walt Disney World theme parks. The MagicBands are $12.95 but are not needed if you just want to use your park ticket for admission and FastPass+ access. If you are looking for a new family road trip adventure this summer, try a cruise! We took the truckster down to Miami Florida to check out Disney’s newly re-imagined Magic Cruise Ship. The highlight is the new water attractions and the Aqua Dunk. Lisa got invited to ride Disney’s Seven Dwarfs Mine Train at the Walt Disney World Media Event. She had a blast and did a great job capturing this video from the very front row so you can ride now too. When you get your Disney World Magic Bands you can resize them and decorate them with Disney Bandits, Magic Sliders, and CoverBands. Here are some Disney MagicBands tips. Before the Truckster we were doing fun reviews, mostly at Disney World. Here is one of our first reviews of the Baby Cakes Bakery that opened at Downtown Disney. Lisa and I had the pleasure of meeting Pepe from The Muppets while on the Disney Fantasy, Disney’s newest cruise ship. This interview makes me laugh every time I watch it. And if you have not tried the Muppet interactive game that you can play on the Disney Fantasy or Disney Dream cruise ship, it’s a must do. 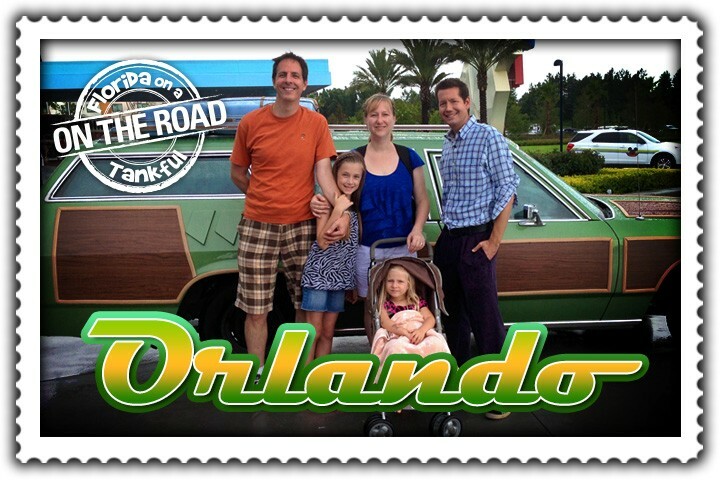 We took a family vacation to Walt Disney World in our new Griswold Family Truckster. Disney filmed this awesome piece. Here is the video.